The expanded family of HIC column chermistries from PolyLC™, Inc. now includes the LC-MS capable PolyBUTYL A™, PolyPENTYL A™, PolyHEXYL A™, PolyHEPTYL A™, PolyOCTYL A™, PolyNONYL A™, and PolyDECYL A™ to span the widest range of hydrophobicities to address the needs in Top Down proteomics. Compared to other hydrophobic interaction chemistries, the PolyLC HIC chemistries (PolyMETHYL A™ through PolyDECYL A™) are extremely responsive to small changes in salt concentration. By approaching binding and loading conditions empirically, one can witness dramatic increases in resolving capacity. 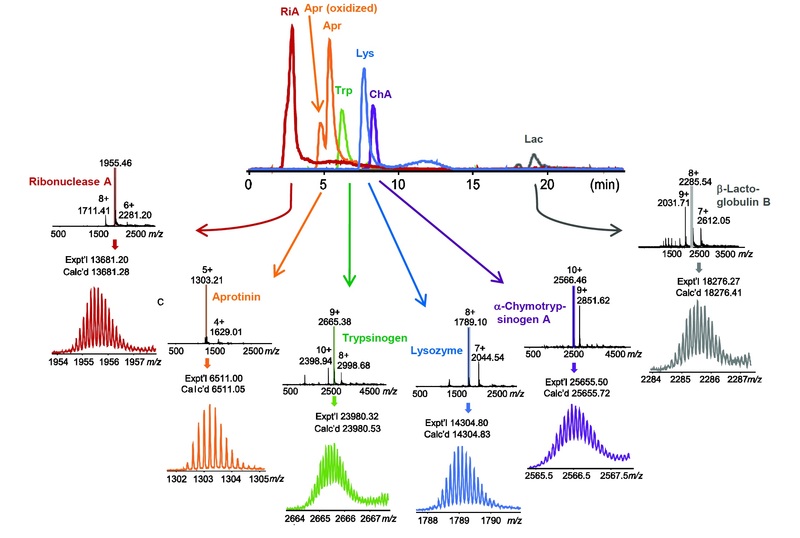 The newest additions, BUTYL through DECYL, on 1500Å pore, 3µm silica, open application of HIC to LC-MS of intact proteins, facilitating Top Down proteomic studies. HIC is an extension of reverse phase chromatography (RPC) where the polarity of the mobile phase is increased by the addition of salt. The more polar the solvent, the longer the retention. A partitioning occurs into the HIC, weakly hydrophobic, phases as the surface water on the protein is displaced by salt, thus making the protein more hydrophobic. The overriding reason HIC is used is to avoid the denaturing of proteins. In RPC, the organic solvents required to elute proteins can denature the sample. Or the sample sticks too well to these substantially more hydrophobic surface chemistries and the RPC solid support then denatures the sample. MS-compatible, ammonium tartrate (and ammonium acetate) salt is especially useful for on-line HIC-MS. It has selectivity comparable to that of ammonium sulfate. Furthermore, the selectivity obtained with it is orthogonal to that of RPC. If using a guard column as a methods development column, gradient times should be shortened to 5-8 minutes; the flow rate should remain at the appropriate ml/minute analytical level. (This way you can accomplish 4-6 experiments in one hour (including flushing and equilibration) speeding up methods development, since a column void volume will take 20 seconds). The relationship of flow rate to the internal diameter of analytical columns can be determined from our scaling factor table for columns. First, make an injection under the low salt strength conditions to assure that the protein will elute. If considerable delay in retention is seen, increase the rate of solubilization and release from the column by lowering the buffer to 10 mM, or use detergent or 1-5% organic solvent in both reservoirs. If the protein elutes in the void volume then use stepwise increases (i.e. 500 mM, 1.0 M, 1.5 M then 2.0 M salt) of the high salt conditions (solvent A) until the binding profile doesn't change. This will assure sample binding, shorter operation times and minimize the risk of precipitation or irreversible conformational changes of the proteins. Because proteins are sorted by surface hydrophobicity rather than total contact hydrophobicity, you can change the water of hydration by adding or deleting small amounts of salt to cause subtle changes in their surface hydrophobicity. Structure promoting salts in the Hofmeister series (citrate>tartrate>sulfate> phosphate>chloride) increase the ability of these columns to retain and discriminate between proteins or peptides by affecting the surface hydration and conformation (note that as few as 9 amino acids are necessary to form a beta-pleated sheet and 30 can form an alpha helix.) Using different alkyl chain length columns will then maximize these differences, depending upon the accessibility of the hydrophobic pockets of the proteins. If trying HIC for intact protein LC-MS on the PolyBUTYL A, PolyPENTYL A or PolyHEXYL A, volatile buffers, such as ammonium acetate, will be required. A dramatic example of this methods development technique working better than a single linear gradient from high salt, was in the isolation of anti-Factor VIII from ascites fluid. It was achieved by determining that the separation of anti-Factor VIII from other blood proteins on the PolyPROPYL A column could be achieved if started at 1.0 M salt. If the gradient started at 1.3 M salt they co-eluted at 800-700 mM salt. If sulfate is not available or the baseline excursions from viscosity changes in the UV detector are unsatisfactory, initial operation with phosphate gradients has been shown to be a good alternative. If the protein is sensitive to sulfate, use of 1.2 M potassium citrate is recommended, but then use 280 nm for UV detection. Alternatively, fluorescence detection (280ex, 330em ) will avoid all baseline changes from impurities or refractive index effects on the UV detector. Application of the sample should be in the smallest practical volume (< 5% ) and in the most concentrated salt solution as possible without precipitating the proteins outside of the column. Make up a 0.1 M buffer/salt solution to dissolve the sample and dilute it with the strong salt solution to the desired concentration for injection (minimum 25% sample v/v) to promote retention to the head of the column. The capacity of the packing is high (400 mg/gm for batch adsorption) and a column should be able to handle 1-5 mg of protein in a high resolution separation of moderate complexity. Change from the ammonium to a sodium salt. Use a longer chain length (ALKYL) Aspartamide (e.g.pentyl) chemistry. Increase the salt concentration of the sample. Increase the salt concentration of the solvent. The Hofmeister Effect and its implications for HIC. A discussion of the ranking of various ions toward their ability to retain (precipitate) a mixture of proteins. Use a shorter chain length (ALKYL) Aspartamide (e.g. methyl). Decrease the salt concentration of the solvent. Change the pH of the buffer to increase the ionic character of the peptide. The use of these columns as reverse phase columns is possible although the very hydrophilic coating will be weakly retentive relative to a C3 RPC column and they will not tolerate TFA in the mobile phase. The polarity of the peptidic surface chemistry is quite varied as compared to other HIC columns. The PolyETHYL Aspartamide HIC is about 60% as retentive as the PolyPROPYL Aspartamide HIC, and the PolyMETHYL Aspartamide HIC is only 18% as retentive as the PolyPROPYL Aspartamide based on relative retention times. Selection of a column is quite empirical, although if the protein is soluble without detergents the PolyPROPYL Aspartamide column is probably the best choice. For larger proteins and MaB the PolyBUTYL A (for ADC's) and the PolyPENTYL A for large proteins are suitable. The following are typical operating conditions for non-LC-MS systems. It is recommended that you filter all mobile phases and samples to avoid plugging the inlet frits. B: 100% 0.1M K-PO4, pH 6.5; 0-100%B, linear, 40 min (15 column volumes), 1.0 ml/min. 4. Flush with 5 c.v. H2O at end of day and plug the column ends. "Conditioning new columns" to reproduce earlier results. A pH range of 3.0-7.0 is recommended since these columns are based on 300Å silica, chemically bonded with a polymeric amide (peptide like) chemistry. The capacity of the packing is high (400 mg/gm for batch adsorption) and a 4.6 x 200mm analytical column should be able to handle 1-5 mg of protein in a high resolution separation of moderate complexity. Use the scaling factor table to determine the expected capacity of your column. To elute proteins with unusually strong hydrophobic character, detergents or solvent compositions of 50% organic may be used in the gradient without detrimental effects to the packing's surface chemistry. However, to obtain longest column life, exercise care when using organic solvents to prevent precipitation of salts. Do not use TFA or strong acids in the mobile phases on these columns since the peptidic bonded phase could be damaged. At the end of the day, flush the analytical column with at least 5 c.v. of distilled water. To remove strongly retained components DMSO is preferred to guanidinium chloride. Injected in 5% c. v. aliquotes under no salt conditions. If the column is to be left for more than 4 days, storage in 100% methanol is recommended. See PolyPENTYL A for HIC-MS of intact large proteins, or PolyPROPYL, PolyETHYL, or PolyMETHYL A for HPLC of proteins.